Are you working on a vehicle that you have decided to customize? One of the things that people will customize on a vehicle is the car gauge panels or truck gauge panels. If you are going that route, though you will probably be needing some custom gauge sets and gauge faces. If you want it done right though, you want to make sure you have a company you can trust to make them and to handle the custom panel design. You don’t have to go anywhere else to find the company for you, you are already here! We can take care of your custom gauge panels in Hampstead, NC. All right here at Hampton Engineering! Everything that is made is machine billet, cast aluminum or stainless steel hardware. 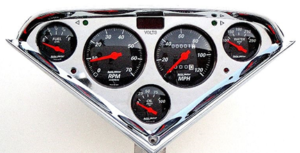 There are many reasons why someone may need custom gauge panels. In most cases though there are two reasons one because they want to customize a vehicle to make it customized to them and their likes. The other reason they are having a hard time finding the original gauge panel they need. They don’t want to sit on the project and they just want to get it done. We are the place for custom gauge panels! We will make sure to take the time to find out what it is you really want because we want to make sure you get it. We have been open for 13 years, so we have the experience that you are looking for to make sure it is done right. We will use the best quality materials so you end up with the quality product when finished. Looking for that hard to find Chevy cluster? Come talk to us!